The International Accounting Standards Board (IASB) and Financial Accounting Standards Board (FASB) have jointly issued the new revenue standards, IFRS 15/ASC 606 Revenue from Contracts with Customers. They become effective for annual periods beginning on or after January, 1, 2018. A company sells printers and cartridges. Recently it created a contract with a customer about a package containing 1 printer and 1 cartridge. The contract price of the printer is 80 EUR and for the cartridge 20 EUR. If printer and cartridge would be sold independently the price for the printer would be 100 EUR and for the cartridge 50 EUR. The delivery of printer and cartridge happens at the same time. After delivery, the invoice for both items is send to the customer. Step 1: Identify the contracts with the customers (IFRS 15.9ff) – what qualifies it as a contract? For many entities step 1 will be relatively straightforward. The key point is to determine when a contract is existing. The SAP system automatically identifies each sales order as one revenue recognition contract. Step 2: Identify the separate performance obligations (PO) (IFRS 15.22ff) – how to identify those deliverables that were accounted performance obligations? For standard sales orders with multiple line items, the SAP system determines each line item as a distinct performance obligation. Step 3: Determine the transaction price (IFRS 15.47ff) – how to measure the total revenue arising under a contract? IFRS 15 typically bases revenue on the amount to which an entity is entitled. The SAP system identifies the net value of the sales order as the transaction price. Step 4: Allocate the transaction price to the separate POs (IFRS 15.73ff) – how to allocate the transaction price between the different performance obligations identified in step 2? The standalone selling price (SSP) or estimated standalone selling price (ESSP) can be maintained in the SAP system. For each performance obligation (i.e., each item in the sale order), the SSP or ESSP appears automatically as condition type in the pricing procedure. When a sales order is saved in the system, the transaction price is allocated to each performance obligation automatically based on the relative SSP of each distinct item. The App “Allocated Revenue” shows the allocated amounts for each performance obligation (POB) based on the relative standalone selling price of each distinct item. The final step is to determine for each performance obligation, when revenue should be recognized. Revenue is recognized when the performance obligation is fulfilled – that is when the goods issues are posted. The revenue recognition entry created by the system records the contract asset and is based on the ‘allocated revenue’. The performance obligation is fulfilled. The system records costs and recognizes revenue base on allocated amounts. 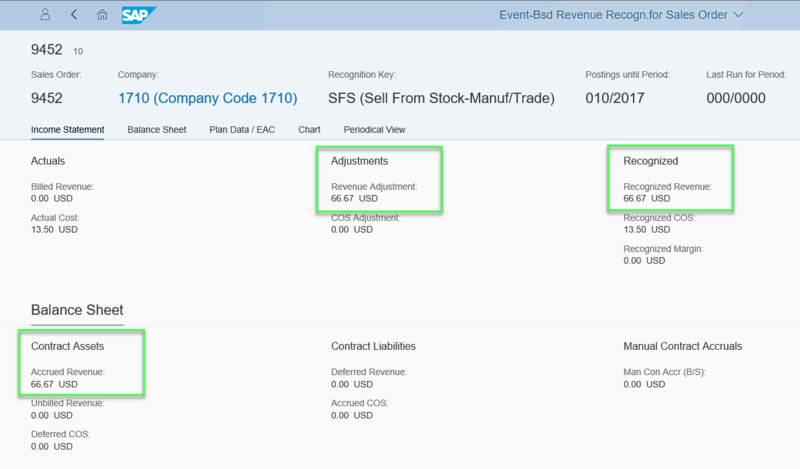 The App ‘Revenue Recognition (Event-Based)-Sales Orders’ shows contract balances, contract assets and contract liabilities in the balance sheet, as well as the recognized revenue and costs for each performance obligation for every sales order in the income statement. With the billing contract liability is recorded based on transaction price. 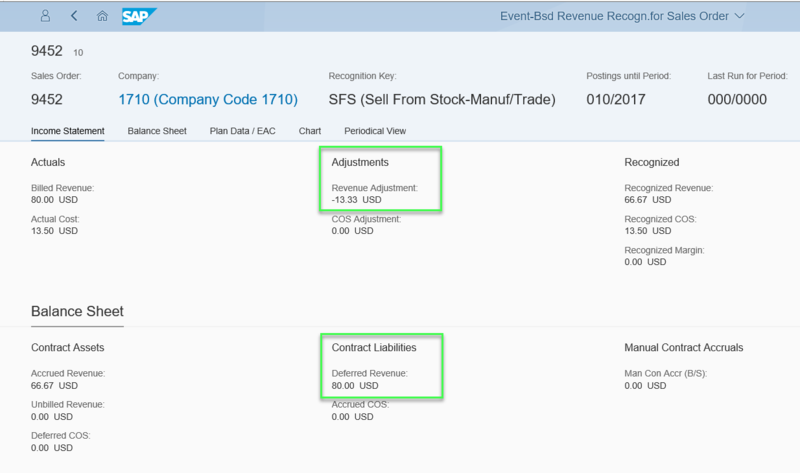 The App “Revenue Recognition (Event-Based)-Sales Orders” shows updated account balances in the income statement and balance sheet after billing. With the period end run netting of contract asset and contract liability happens for sales order. In our example the sales order is completely delivered and billed therefore the balance of each sales order item is the difference between the transaction price and the allocated revenue. 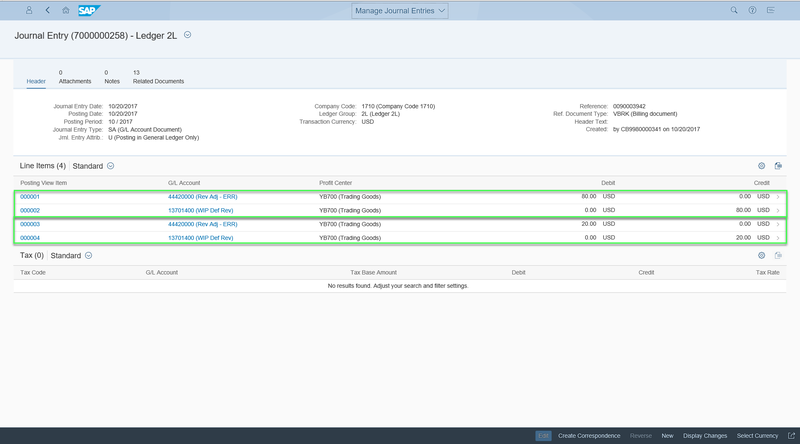 We call the App ‘Run Revenue Recognition – Sales Orders’ from Fiori Launchpad. 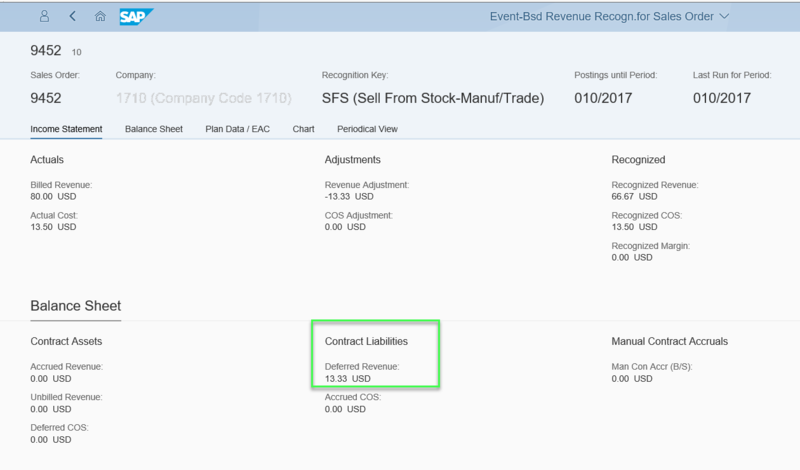 The App “Revenue Recognition (Event-Based)-Sales Orders” shows the updated amounts on contract assets and contract liabilities in the balance sheet, after period end run has been conducted. In my next blog, I will demo a customer project scenario with fixed price services. We are working on IFRS 15 application in S4 HANA Cloud implementation Project.